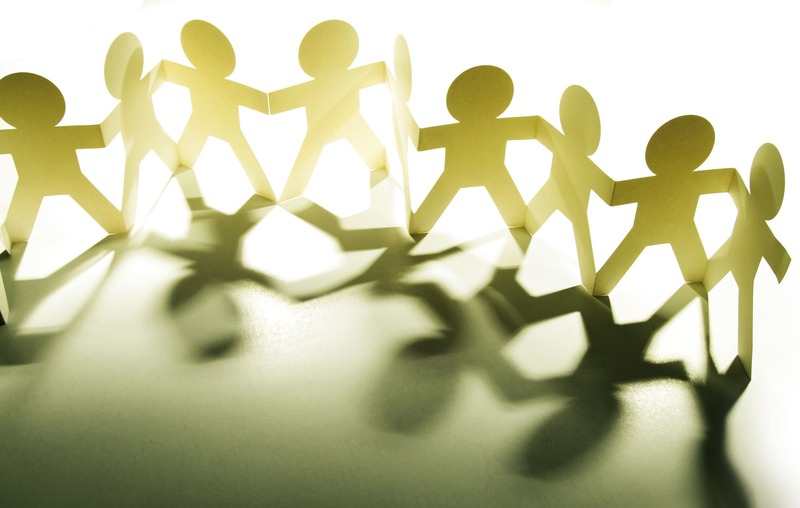 Home Leadership Social Value What is business good for? Larry Fink, chief executive of $6.3trillion asset manager BlackRock, made headlines in mid-January with his open letter, warning CEOs to focus on the social purposes of their companies to ensure long-term value. While Fink is certainly the most prominent and mainstream voice to highlight the need for companies to assess the full scope of their impact on societies in which they operate, he is by no means the first. In fact, our understanding of the role of business relative to society and our beliefs about how and what business should therefore contribute has evolved through several incarnations over the years. In its earliest stages, expectations for corporate citizenship were limited to philanthropic activity: companies made contributions that were unrelated to their core business and required little action beyond writing a cheque to the nearest opera house. By the early 2000s, companies had begun to see the value of aligning their philanthropic activity with their core business and started to draw on the skills and expertise of their employees to make more meaningful contributions, through volunteering, for instance. Following the 2008 financial crash, the focus of corporate responsibility turned towards harm reduction and risk mitigation, with companies seeking to reduce carbon emissions and waste in the supply chain and improve employee safety. Spurred in part by shareholder initiatives, these efforts led to a new class of non-financial corporate disclosure: 99 of the FTSE100 companies now report their carbon usage and 70 have publicised carbon reduction targets as of 2016, according to a recent report from UK consultancy Carbon Clear. Similarly, 82 per cent of the Fortune 500 now issue a corporate social responsibility or sustainability report, according to the Governance & Accountability Institute. The latest conceptualisation of corporate responsibility has emerged within the last few years and looks beyond simple harm reduction towards the positive effects, or ‘social value’, a business can create. Social value in this sense takes many forms, ranging from the reformulation of ingredients to create healthier foods for children, to partnerships with civil society to expand sales and distribution of hygiene products to remote areas of the developing world, or to programmes to promote a diverse and inclusive workforce. In this paradigm, companies are expected to consider the financial and non-financial impacts of their business on all stakeholders and to hold an equal seat at the table alongside government and civil society in addressing major societal challenges. Moreover, recent studies by the Boston Consulting Group and others have shown that companies that take this broad lens on societal impact significantly reduce risk and open up valuable new opportunities in the form of new markets, customers and products. The question of how business relates to society is hardly a new one, but as Fink’s letter suggests, it is becoming more pressing than ever. A number of other large institutional investors, including State Street Global Advisors, have joined BlackRock in calling for companies to go beyond financial results and use more holistic performance criteria. Recently proposed changes to the UK Corporate Governance Code by the Financial Reporting Council would require companies to disclose how they ‘contribute to wider society’, alongside their efforts to generate value for shareholders. At a macro level, companies face closer scrutiny as a result of the increased transparency that social media creates. They must appeal to the Millennial generation, which shows strong inclinations to work for and shop at businesses that are considered to be socially responsible. A global backlash against capitalism – in many ways the legacy of 2011’s Occupy Wall Street – has led to a new wave of populist agendas and leaders in developed countries around the world. 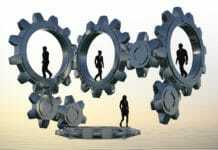 Within the business world, other forces are creating the need to examine more closely corporate engagement in society. The concept of corporate ‘ecosystems’ is quickly gaining popularity and is prompting many companies to seek partnerships with non-traditional players, like non-profits and governments, in order to achieve business goals. Similarly, there is a growing recognition that the private sector has a significant role to play if the 2015 UN Sustainable Development Goals are to be met. In other cases, it is public opinion – and discontent with government inaction – that is pushing companies to step up. In the wake of the United States’ 2017 withdrawal from the Paris Agreement on climate change, for example, more than 2,500 US organisations, including Apple Inc. and Nike Inc., formed the We Are Still In initiative to pledge their ongoing allegiance to meeting the agreement’s emissions targets. At the same time, the risks for companies that fail to sufficiently consider long-term social value grow more daunting. Several companies, including BP plc, Volkswagen AG and Wells Fargo Corp., have seen significant damage following negative events that could have been avoided if short-term profits were balanced against long-term environmental and social impact. Failure to enforce moral rigour also increasingly comes with a price and not only for business: the UK-based charity Oxfam International faced a loss of government funding when allegations surfaced that its staff had sexually abused disaster victims. While it is clear that companies face an increasing imperative to incorporate social value thinking into strategic decision-making, it is less clear that their boards are prepared to do so. To understand if and how corporate boards are weighing social value expertise in recruiting new outside directors, we turned to our own database of work to analyse more than 2,300 position specifications for non-executive directors between the years 2000 and 2017. Our goal was to discern trends in the usage of terms related to social value, such as stakeholders and sustainability, as well as personal attributes that would suggest an affinity for social value, such as morals or ethics. We found that the incidence of these terms has steadily increased. On average, at least one of the five most common terms appeared in 12 per cent of director in the eight years leading up to the 2008 financial crash; that jumped to 30 per cent in 2009. Last year, these terms appeared in almost 40 per cent of all specs. Our data makes clear that in the immediate aftermath of the crisis, many companies were seeking board members who could complement their business acumen with a non-financial lens (see Figure 1). However, it’s also clear that to the extent that boards are prioritising these attributes in director recruitment, they remain narrowly focussed on innately altruistic personal attributes rather than technical expertise related to social value. For example, 50 per cent of the 2017 specs included some form of the word ethics, but only nine per cent mentioned some variant of corporate responsibility. 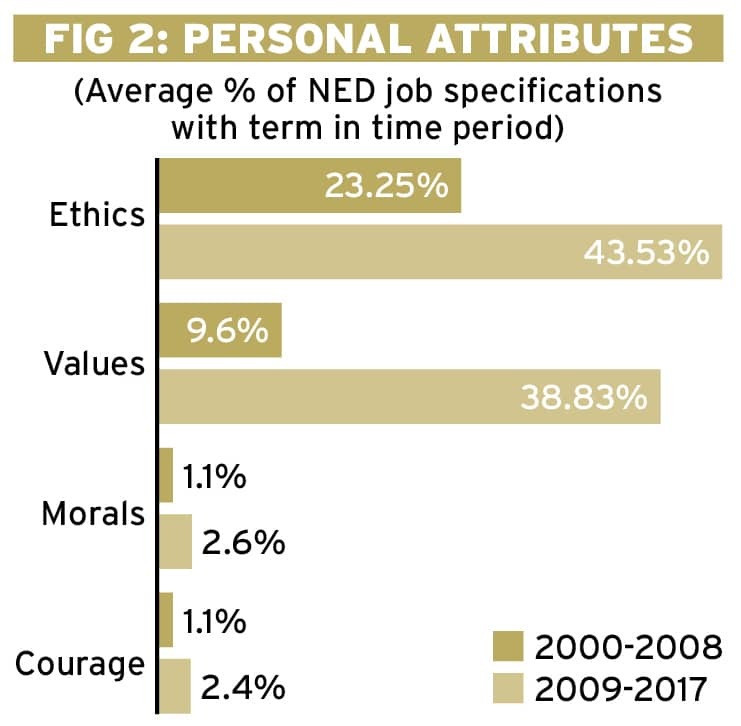 Furthermore, personal attributes with passive connotations, such as ethics and values, appear significantly more often than those with active undertones, like courage and sense of purpose (see Figure 2). 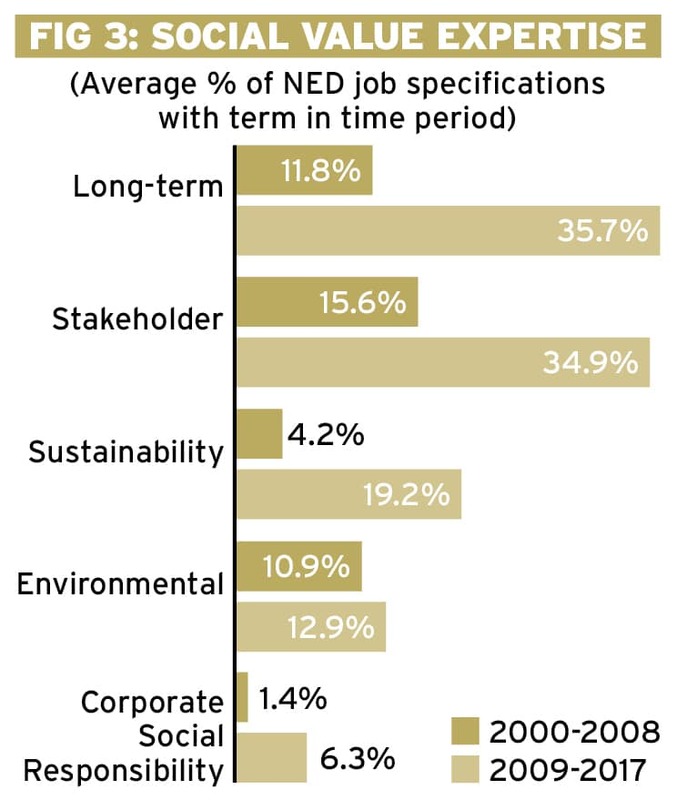 Among the expertise-focussed terms, those related to environmental sustainability are most commonly sought: forms of the word sustainable appeared in 22 per cent of non-executive director specs in 2017, up from two per cent in 2000, while environmental saw a similar increase from two to 16 per cent. These trends suggest there is a growing awareness of the need for a social value orientation at the board level, but that it remains narrowly focussed on harm reduction rather than social value creation (see Figure 3). Unsurprisingly, we see variance in the ways and speed at which these terms have been adopted across industries. The financial services sector – arguably at the heart of the 2008 crash – saw the largest increase in social value terms (up 46 per cent since the crash), suggesting a recognition for the need to mitigate damage done with a forward focus on responsibility. Of particular note, terms related to inclusion were included in fewer than one per cent of specs pre-crash but jumped to seven per cent in the years since. 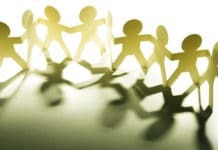 Retail saw a 39 per cent increase in social value terms, with variants of corporate social responsibility appearing in three per cent of specs prior to 2008 and eight per cent after. 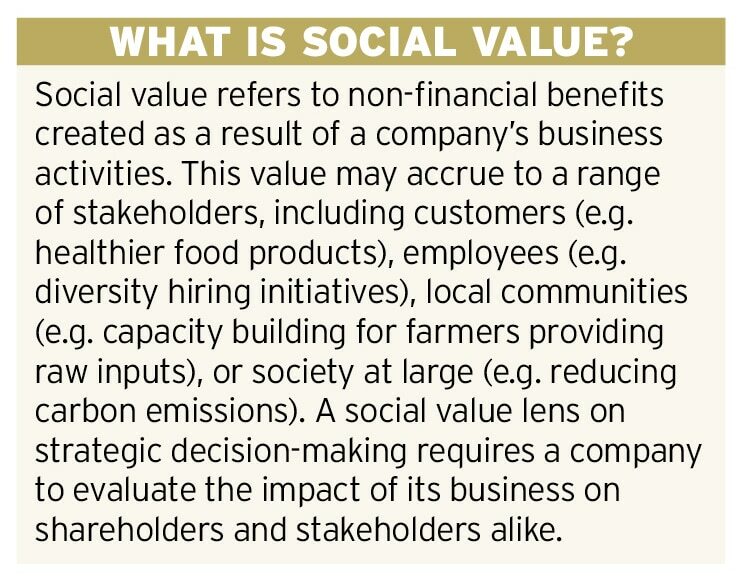 Social value-related terms increased 29 per cent among industrial goods companies, with terms related to sustainability rising from five to 22 per cent and stakeholders from 18 to 35 per cent. As companies consider how to bring social value perspectives into the boardroom, we see a helpful roadmap in the journey many of our clients have recently taken to integrate digital considerations into director selection and corporate strategy. Just a decade ago, digital was still seen as a siloed business topic. Boards brought in digital experts to advise on specific situations, but rarely looked for such expertise in directors themselves. Now, digital is fully integrated into strategic decision-making in most companies and ‘digital directors’ are increasingly in demand. This trend is clear when we analyse our database of director specs for terms related to digital themes. Looking again at the years between 2000 and 2017, we find the term digital appeared in 36 per cent of 2017 specs, up from an average four per cent between 2000 and 2008. The term mobile saw a similar ramp-up, appearing in 67 per cent of 2017 specs, from an average of eight per cent before 2008. When we look at the directors that companies have chosen to fulfil their digital mandates, we see several distinct profiles, ranging from people with traditional corporate backgrounds and a working knowledge of digital issues, to leaders of digital transformations within businesses, to industry disruptors from emerging digital companies. While it is essential that boards look first and foremost for excellent business people who can contribute to a broad range of topics, there is often some trade-off between subject matter expertise and general management experience. That means boards have had to be open to non-traditional candidates who may not have previous board experience – such as start-up CEOs or business unit managers – to find both breadth and depth. Similar lessons apply as boards begin equipping themselves to elevate social value to a strategic level. A robust understanding of business will always be table stakes for any director candidate, but boards will increasingly want to identify director talent whose understanding of business includes an appreciation for how social value issues materially impact the business. CEOs of top charities, social venture fund investors and executives from the companies at the forefront of the social value movement will likely be obvious candidates, as they are the most likely to have experience of measuring non-financial impact and taking a stakeholder-oriented lens on strategy. Undoubtedly other attractive profiles will also emerge. Who are our major stakeholders? If every corporate action were transparent, would it have a positive or negative effect on our share price or market cap? What percentage of board time is allocated to discussions around the contribution the organisation makes to society? Are there metrics in place for the board to assess social impacts and risks? Does the board believe the management team has an understanding of social risk? Do we know which of our major investors integrate environmental, social and governance (ESG) factors into their investment decision-making and are we engaging with them? Emily Meneer is a member of the firm’s Non-profit and Board Effectiveness Practices. She has significant experience in management consulting, corporate social responsibility, and non-profit strategy and performance measurement. Emily joined Russell Reynolds from Bain & Company, where she was a Senior Specialist in the Social Impact practice. She served as internal expert to consulting teams on a variety of topics including non-profit growth strategy, Board effectiveness, stakeholder engagement and fundraising strategy. 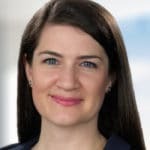 Prior to this, Emily worked for the Canadian government at the Canadian International Development Agency (CIDA) and the World University Service of Canada (WUSC), supporting program development and results measurement of global development investments. Simon Kingston is Head of the firm’s Nonprofit sector and leads the Global Development Practice. He has a particular interest in higher education, development and public policy. 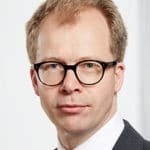 He serves clients in a range of countries, conducting searches, among other things for university vice-chancellors, chief executives and senior leaders of major global development organisations and directors of government departments. His recent engagements include supporting the world’s largest emergency relief organisation in the appointment of its Secretary-General and advising on the most senior appointments of a regional development bank. Simon has longstanding relationships with leaders in public-private partnerships in global public health where he advises and supports them on leadership appointments.